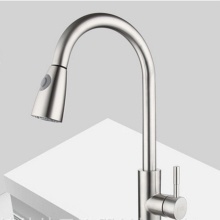 The faucet has hot and cold water, giving you warm and comfortable washing especially at winter. Pull out hose inside and swivel design make the washing of sink more easy. Drip Free Ceramic disc cartridge for smooth and long lasting operation. With swivel spout fit for two sinks. Complete with hot and cold water hoses and accessories.